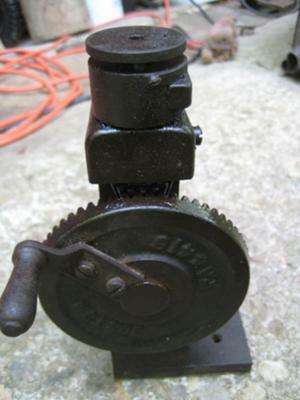 This item stands about 7" tall and is made of cast iron and steel, except for the turned wooden crank handle. The crank turns a large crown gear that engages a small pinion on a vertical shaft. The shaft goes to what looks like a 1/4" collet. Just above the collet is a removable round plate with a 1/4" hole in the center and a series of wire-sized holes in a line leading out from the center. One of the holes has a stub of wire sticking out. The removable plate is mounted on two pins that have angled ends to fit the angles in the bottoms of the mounting holes, presumably to make it fit only one way. The big crown gear has "Boston" and "PA4416" embossed on it. A total mystery to me. Anybody ever seen one of these? It would be helpful to know what it says on the drive gear, and to have a few close up pics of the collet and round part with holes on it. My guess is that it is to make twisted wire rope or cable.